 Pollution is the unfavorable alternation of our environment, largely because of human activities.  Pollution is defined as a deviation from the natural composition of a part of the environment, resulting in adverse effect of life.  Pollution is an undesirable change in physical, chemical or biological characteristics of water, air and soil that may harmfully affected human, animal and plant life, industrial progress, living conditions and cultural assets.  Pollution is the release of harmful substances or energy into the environment by man is quantities that health and resources.  Pollution is the accumulation of matter in the wrong place or anything into the environment which degrades its quality. Pollution can be classified as natural i.e. originates from natural processes such as forest fires, natural organics and inorganic decays, volcanic eruptions, earthquakes etc. or Anthropogenic i.e. which originates due to activities of man. However, it is better to classify pollution either according to environment in which it occurs or according to the pollutants by which pollution is caused. In large measures, air pollutants are direct and indirect byproducts of burning coal, gasoline and other liquid fuels and refuse. These fuels and wastes are organic and with complete combustion, the byproducts are CO2 , and water vapor. However, their complete oxidation rarely takes place. In addition, fuels or refuse contain impurities or additives and these are also emitted into the air when burned. Some of these direct products further react within the atmosphere and produce additional indirect products. We may say that air pollution results from gaseous emissions from mainly industry, thermal power stations, automobiles, domestic combustion etc. and packaging. Cement dust is a common air pollutant around cement factories and construction sites which emit plenty of dust, which is potential heath hazard. Chemically it is a mixture of oxides of aluminum, silica, potassium, calcium and sodium. Stone crushers and hot mix plants also create a menace. The SPM levels in such areas of stone crushing are more than five times the industrial safety limits. There are many food and fertilizers industries, which emit gaseous pollutants. Many chemical manufacturing industries emit acid vapors in air. In the past two decades we have seen a tremendous increase in the number of industries in our metros particularly in Delhi, Bombay , Calcutta and Bangalore. Many of these are located in predominantly residential areas. The industries producing sulphuric acid, discharge large quantities of sulfur dioxide in the air and pollute the atmosphere up to a few kilometers. The industries producing fluoride compounds have serious effects on plants, animals and human beings. The toxic effects of fluorides on live stocks arise from ingesting contaminated forage on which fluoride dust has settled. The various iron and steel industries emit sulfur dioxide, oxides of metals and carbon mono and di oxides. Acids are also produced in the atmosphere due to reaction of sulpher di-oxide and nitrogen oxides with water vapors. nitrogen oxides. The two –wheelers and three-wheelers contribute 60% of the total CO, and 83% of total hydrocarbons, whereas heavy traffic vehicles 55 to 80% of the oxides of nitrogen. It is estimated that a car (without cleaning device) on burning 1000 liter of fuel emits 350 Kg CO, 0.6 Kg SO2 ,0.1 Kg lead and 1.5 Kg SPM.. The sources of emission in automobiles are (i) exhaust system, (ii) fuel tank and carburetor and (iii) crankcase. The exhaust produces many air pollutants including unburnt hyrocarbons, CO, NOx lead oxides. There are also traces of aldehydes, esters, ethers, peroxides and ketones which are chemically active and combine to form smog in presence of light. Evaporation from fuel tank goes on constantly due to volatile nature of petrol, causing emission of hydrocarbons. The evaporation through carburetor occurs when engine is stopped and heat builds up, and as much as 12 to 40 ml of fuel is lost during each long stop causing emission of hydrocarbons. Some gas vapor escapes between walls and the piston, which enters the crankcase and then discharges into the atmosphere. This accounts for 25% of the total hydrocarbon emission of an engine. B. Nuclear and Thermal power stations: The catastrophic accident at Chernobyl in USSR in April 1986 is the biggest example of pollution that is being caused by thermal power stations. Radioactive emissions may penetrate through biological tissues in a manner analogous to tiny bullets. They leave no visible marks nor are they felt, but they are capable of breaking molecules within cells. In high doses, radiation may cause enough damage to prevent cell division. In low doses it may damage to DNA molecules. There are a number of thermal power stations and super thermal stations in the country. The National Thermal Power Corporation (NTPC) has setup mammoth coal-powered power stations to augment the energy generation of our country. The coal consumption of thermal plants is several million tones. The chief pollutants are fly ash, SO2 and other gases hydrocarbons. 1. Transport, in which pollutants are carried down wind. The extent of this process depends on wind speed and direction, topographical features and how high in the atmosphere pollutants are injected. 2. Dilution, in which the turbulent motion of air mix and reduce the concentration of pollutants. 3. Transformation, in which pollutants undergo physical changes, including agglomeration, chemical changes and photochemical changes triggered by reaction with incoming solar energy. 4. Removal from the atmosphere by rainout, washout and fallout. Choking of South Asia by a Blanket of Smog: According to a report published in Times of India dated 13th August, 2004, India and rest of the South Asia is covered by a deadly, three km. deep blanket of pollution, which is readily changing monsoon patterns, causing draughts and literally killing hundreds of thousands of people by respiratory diseases. A group of scientists working with the United Nations Environment Program on the Asian Brown Haze has released this study. It said that the vast pollution parcel could endanger the economic success of South Asian Countries, particularly India. The haze has been identified as a deadly cocktail of ash, acids, aerosols and other particles. The study also says that the worst may be yet to come and the effects of the haze would intensify over the next 30 years. Already, higher levels of respiratory diseases are leading to several hundreds of thousands of premature deaths, as revealed by data from seven Indian cities, including Ahmedabad, Kolkatta, Delhi and Mumbai. The Indian data suggested some kind of air pollution was responsible for 24,000 annual premature deaths in the early 1990s, said the report. A few year later, the number rose to an estimated 37,000 per year. UNEP executive director, Klaus Toepfer says, “ In India they are expecting more than two million people to die because of the incomplete burning of biomass.” The open fires used by the majority of ordinary Indians to cook their food also contribute to this. This pollution parcel, which stretches three kilometers high, can travel half way round the globe in a week, thus having global implications. Some of the air pollutants and their effects have been discussed here below. (a) Compounds of Carbon: The two important pollutants are carbon dioxide and carbon monoxide. 1. Carbon dioxide : Human activities are responsible for the increasing amount of this gas in our atmosphere The concentration of CO2 in the earth‟s atmosphere currently is 360μl/L, which is approximately 30% higher than the pre industrialization level and is conservatively projected to double by the end of first decade of 21centuary. Around 1900, the concentration of CO2 in air was 290ppm, in 1960 it was about 315ppm and it is increasing at a rate of approximately 1.0mg/kg/year. The reasons given for this situation are: (a) depletion of forest cover, (b) burning of fossil fuel, (c) increased number of living organisms and, (d) upset of balance in exchange of CO2 between oceans and atmosphere. Major amount of carbon dioxide is released in the atmosphere from burning of fossil fuel (coal, oil etc) for domestic cooking, heating etc. and the fuels consumed in furnaces of power plants, industries, hot-mix plants etc. From fossil fuel alone more than 18 X 1012 tones of CO2 is being released into atmosphere each year. In our country, on an average, thermal power plants are likely to release around 50 million tones of CO2 each year in the atmosphere. Greenhouse effect: The term green house effect was coined by Jean Fourier more than 100 years ago. Since CO2 is confined exclusively to the troposphere, its higher concentration may act a serious pollutant. Under normal conditions (with normal CO2 concentration) the temperature at the surface of the earth is maintained by the energy balance of the sun rays that strike the planet and heat that is radiated back into space. The earth‟s surface and atmosphere receive energy from the sun. This energy comes in the form of radiation mainly in the visible region, =400-700nm. Much of UV light ( 400nm) from the sun is filtered out in the stratosphere and warms the air there rather than at surface of earth. Besides visible light, we receive some infra red (IR) light in the region 800-4000nm. Of the total incoming light that impinges upon the earth, about 50% reaches the surfaces and is absorbed by it. About 20% of the incoming light is absorbed by gases in the atmosphere, such as, UV light by ozone in stratosphere and IR by CO2 and water vapor in air. The remaining 30% is reflected back in to space by clouds, ice, snow and other reflecting bodies without being absorbed. Like any other warm body, the earth emits energy, the amount of the energy that the planet absorbs and the amount that it releases must be equal if the temperature is to remain constant at earth. The emitted energy is neither visible nor UV, it is IR light having wavelength in the range of 4000-5000nm which is called thermal infra red region. Some gases in the air such as CO2 , temporarily absorb thermal infra red light and, therefore, not all IR emitted from the earth‟s surface and atmosphere escape directly in to space. Shortly after its absorption by CO2 molecules, this thermal IR light is remitted in all directions. Thus some thermal IR is redirected back towards the earth‟s surface and is reabsorbed, and consequently further heats to both, the surface and the air. This phenomenon of redirection of thermal IR towards the earth is called the green house effect. Thus, the green house effect is trapping of heat caused by gases such as carbon di-oxide and water vapor which are transparent to incoming solar radiations but re-emit the infra red radiations from earth‟s surface. This is responsible for keeping the temperature of earth‟s surface at +15 C rather than -15 C ( if there would had been no atmosphere). The phenomenon that worries us is that, increasing the concentration of trace gases in atmosphere, that absorb thermal IR, would result in the redirection of even more of the out going thermal IR energy and would increase the average temperature of earth surface beyond+15 C. Most of the heat is absorbed by CO2 layer and waters vapors in the atmosphere, which adds to the heat that is already present. CO2 increases the earth temperature by 50% while CFCs are responsible for another 20 % increase and there are enough CFCs up there to last in 120 years. to some extent is absorbed by the oceans. But with the industrialization of West and increased consumption of energy, CO2 was released into atmosphere at a faster rate than the capacity of oceans to absorb it. Thus its concentration increased. According to some estimates CO2 in air may have risen by 30% since the middle of 19th century. It may even be doubled by 2030 A. D.
There are some difference of opinions, however, about the extent of rise in earth‟s temperature due to increasing CO2 levels. According to some computerized models, doubling the CO2 level will increase the global mean temperature (15C) by 20 C. But, some others say that this will be less than one quarter of a degree. However, even a change of two degrees may disrupt the earth‟s heat budget, causing catastrophic consequences. The green house effect is being greatly intensified by certain other gases that human beings are introducing into the atmosphere. In partcular, methane, chloroflurocarbons (CFCs), and nitrous oxides absorb infra-red 50 to 100 fold more effectively than carbon di oxide. Consequently, while the amounts of these gases being emitted into the atmosphere are far less than the amounts of carbon di oxide, they have an effect on climatic warming which nearly equals that caused by the CO2 additions. The term green house gases is used to denote CO2 and these other gases that absorb infra red radiations and lead to climatic warming. (c) By increasing the fuel efficiency of vehicles and all other forms of energy conservation since energy production is nearly all based on the burning of fossil fuels. (ii) Use of non-conventional sources of energy and develop and implement no-fossil fuel energy alternatives. (iii) To put a check on clearing of forests, particularly those of tropical regions. (iv) By carrying out maximum plantation of trees. Impacts of enhanced green house effect: The enhanced green house effect will not only cause global warming but will affect various other climatic and natural processes. 1. Increase in global temperature: The global temperature has been observed to increase ever since systematic recording of this temperature has been initiated. The world temperature has increased by 0.7C from 1860 to 1990AD. Where as temperature of tropical ocean has risen by 0.5C for the last 30 to 50 years. It is estimated that the earth‟s mean temperature will rise between 1.5 t0 5.5 C by 2050 if input of green house gases continue to rise at present rate. than the global average while warming in the tropics may be only 50 to 100% of the average. The increased warming at poles will reduce the thermal gradient between the equator and high latitude regions decreasing the energy available to the heat engine that drives the global weather machine. This will disturb the global pattern of winds and ocean currents as well as timings and distribution of rainfall. Disturbed rainfall will result in some areas becoming wetter and the others drier. 3. Rise in sea level: With the increase in global temperature sea water will expand. Heating will melt the polar ice sheet and glaciers resulting in further rise in sea level. Current modes indicate that an increase in the average atmospheric temperature of 3C would raise the average global sea level by 0.2 to 1.5 m over the next 50-100 years. One meter rise in sea level will inundate low lying areas of cities like Sanghai, Cairo, Bangkok, Sydney etc. Life of millions of people will be affected by the sea level rise. 4. Effects on human health: The global warming will affect the distribution of vector of disease like mosquitoes. The diseases like malaria, filariasis and elephantiasis will increase. More temperature and humidity will increase respiratory and skin diseases. 5. Effects on agriculture: Tropical and subtropical regions will be affected more since the average temperature in these region is already on higher side. Even a rise of 2C may be quite harmful to crops. Soil moisture will decrease, evapo-transpiration will increase which may drastically affect many crops. Kyto Protocol: Over a decade ago, most countries joined an international treaty- the United Nations Framework Convention on Climate Change- to consider what could be done to reduce global warming and cope with whatever temperature increase are inevitable. In 1997, the governments agreed to an addition to the treaty, called the Kyoto Protocol, which legally bound industrialized nations to reduce world wide emmission of green house gases by an average of 5.2% below their 1990 level by 2012. The cut are.nt uniform- while most of the Western European Countries committed to cuts in the vicinity of 85, the rates vary across countries. Some countries such as Iceland, can actually increase emmission upto 10% under the treaty, which came in to effect on February 16, 2005. China have signed the treaty, they aren‟t required to make any cuts in emmissions till 2012, the logic being that the developing nations shouldn,t pay a price for late industrialization. The Kyoto protocol contains measures to assess performance and progress. It also contains some penalties. Countries that fail to meet their emmission target by the end of first commitment period (2012) must makeup the difference plus a penalty of 30% in the second commitment period. Their ability to sell credits under emmissions trading will also be suspended. Is the World’s Climate Really Changing: Many Scientists believe so. The UN‟s Intergovernmental Pennal on Climate Change (IPCC) summarises the work of 2,000 of the world‟s top most climate experts. Its reports say that the world is definetly getting warmer. The IPCC says the average global surface temperature has risen by about 0.6 degrees Celsius since 1900, with much of that rise coming in the 1990s- probably the warmest decade in 1,000 years. The IPCC also found that the snow cover since the late 1960s has decreased by 10% and lakes and rivers in the Northern Hemisphere are frozen over about two weeks less each year than they were then. Mountain glaciers in non-polar regions have also been in noticeble retreat in the 20th centuary, and the average global sea level has risen between 0.1 and 0.2 meters since 1900. Albido: Albido is a Latin word meaning-whiteness. It is defined as” Albido is the ratio of the total radient energy flux reflected or scattered in all directions by an object to the total radiant flux intercepted by the object. This formal definition is strictly appropriate only in the context of certain special cases. These concern reflection of sunlight from entire and isolated bodies such as planets, or the reflection of sunlight from individual particles or molecules. Ground level measurements of albedo are not made in a way that is consistant with the above definition. Using a horizontal surface as an example, it‟s measured albedo is the ratio of the upward component of the flux density (flux per unit area) of radiation scattered or reflected from the surface to the downward component of the incoming flux density. The measurement is normally taken in the context of solar radiation reflected by the ground or by some other horozontal surface such as a deck of cloud. It is obtained by an albedometer, which measures separately and simultaneously both the up-welling and down-welling flux densities at some small distances above the surface in question. These sensors are flat-plate absorbers. Thus, the typical observation of albedo does not involve measurement of radiation scattered in all directions by the particular small area of surface. Rather it involves measurement of the radition scattered into a horizontal unit area above the surface from all parts of the surface within view of the downward looking flat plate sensor. 2. Carbon monoxide : It is produced by the incomplete combustion of coal, charcoal, petrol and its products. The largest source of combustion producing CO are internal combustion engines. From combustion sources, the CO emission per year in the world is about 2.6x 108 tones. Furnaces, stoves, open fires, factories, power plants give off CO. The source of atmospheric CO is the oxidation of methane. Anaerobic decomposition of organic matter produces methane, which is oxidised to produce CO. Photochemical decomposition of ozone and the reaction of atomic oxygen with water vapor produces hydroxyl radicals, which initiate oxidation of methane. Thus CO production in atmosphere is associated with photochemical reactions. Carbon mono oxide combines with hemoglobin of blood, reducing its O2 carrying capacity. The gas is fatal over 1000 ppm, causing unconsciousness in an hour and death in four hours. If this gas is inhaled for few hours at even a low concentration of 200 ppm, it causes symptoms of poisoning. Inhaled CO combines with blood hemoglobin to form carboxyhemoglobin about 210 times faster than O2 does. Formation of carboxyhemoglobin decreases the overall O2 carrying capacity of blood to cells resulting into oxygen deficiency-hypoxia. At about 200 ppm concentration for 6-8 hours, headache begins, and mental activity gets reduced; above 300 ppm, throbbing headache starts followed by vomiting and collapse; at 500 ppm, man reaches into coma and at 1000 ppm, is death occurs. The accepted maximum allowable concentration (MAC) for occupational exposure is 50 ppm for 8 hours. The increase in carboxyhemoglobin level form 1-2% to 3-4% may cause cerebral anoxia resulting into impairing of vision and psychomotor activity. Sub-lethal concentrations of this gas may be injurious due to prolonged exposure. In smokers, prolonged exposures may cause an adaptive response, even producing more hemoglobin, as high as 8%. At 10% carboxyhemoglobin in blood due to smoking there may be lowered tolerance to CO. Cigarette smokers have increased hematocrit (per cent volume of red blood cells), within minutes of smoking. In developed countries cigarettes are linked to at least 80% of all deaths from lung cancer. Most plants are not affected by CO levels known to affect man. At higher levels (100 to 10,000 ppm), the gas affects leaf drop, leaf curling, reduction in leaf size, premature aging etc. It inhibits cellular respiration in plants. Sulpher remains in the atmosphere in three forms namely, sulphur dioxide, hydrogen sulphide and sulphate particles.. Sulphur dioxide is produced mainly by the combustion of the fossil fuels like coal, mobile oil and petrol. The other S-compounds are carbonyl sulphide (COS), carbon disulphide (CS2), dimethyl sulphide [(CH2)2 S] and sulphates. plants, smelting industries (smelting sulphur containing metal ores) and other processes as manufacturing of sulphuric acid and fertilizers. These account for about 75% of the total SO2 emission. Most of the rest 25% emission is from petroleum refineries and automobiles. In U. S. A., in 1970 there was emitted 37 million tons of SO2. It is believed that about 109 million tons of SO2 are added each year into the global environment. In polluted areas its concentration may reach 3000g/m3, but in non polluted areas the concentration usually remains 0.3 to 1.0g/m3. In our country, SO2 emission is on the increase over the years and it has almost doubled between 1979 and 2000 A.D. The life time of SO2 in the atmosphere depends upon the rate at which it is oxidized On global scale, about half of the ambient SO2 originates from the oxidation of hydrogen sulphide given off by decaying organic matter. The chronic exposures to SO2 causes intense irritation to eyes and respiratory tract. It is absorbed in the moist passage of upper respiratory tract, leading to swelling and stimulated mucus secretion. Exposure to 1 ppm level of SO2 causes a constriction of the air passage, and causes significant bronocho-constriction in asthmatics even at a lower (0.05-0.50ppm) concentrations. Moist air and fogs increase the SO2 dangers due to formation of H2SO4 and sulphate ions; H2SO4 is a strong irritant (4-20 times) than SO2. Plants are affected at lower concentrations of SO2 than human beings. Leaf bleaching, necroses and loss of yield are the main damages caused by SO2. Growth of the ornamental plants Calendula officinalis and Dahlia rosea was adversely affected when exposed to 1to 2 ppm of SO2 for two hours. SO2 is also involved in the erosion of building materials as limestone marble, the slate used in roofing, mortar and deterioration of statues. Petroleum refineries, smellers, Kraft mills deteriorate the adjoining historic monuments. (b) Hydrogen sulphide: The chief sources of H2S are decaying vegetation and animal matter, especially in aquatic habitats. Sulphur springs volcanic eruptions, coal pits and sewers also give off this gas. About 30 million tons of H2S every year is released by oceans and 60 to 80 million tons per year by land. 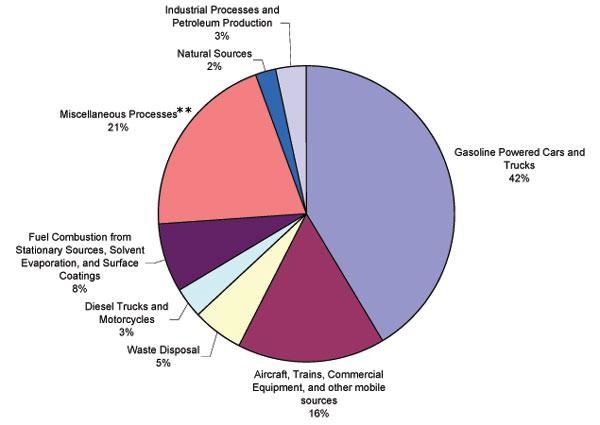 Industries emit about 3 million tons every year. The chief industrial sources of H2S are, users of sulphur containing fuel. In polluted areas its concentration reaches 100g/m3 , while in unpolluted areas its concentration remains around 0.3 g/m3. It is generally believed that hydrogen sulphide is oxidised in to sulpher dioxide but there is not much evidence for this. At a low concentration, H2S causes headache, nausea, collapse, coma and finally death. Unpleasant odor may destroy the appetite at 5 ppm level in some people. A concentration of 250 ppm may cause conjunctivitis and irritation of mucus membranes. Exposure at 500 ppm for 15-30 minutes may cause colic diarrhea and bronchial pneumonia. This gas readily passes through alveolar membrane of the lung and penetrates the blood stream. Death occurs due to respiratory failures. Nitrogen oxides are major primary pollutants. There are measurable amounts of Nitric oxide, nitrous oxide and nitrogen dioxide present in the unpolluted atmosphere. Of these nitric oxide (NO) is the pivot compound. It is produced by combustion of O2 and N2 during lighting discharges and by bacterial oxidation of NH3 in soil. Nitric oxide contacts with air and combines with O2 or even more readily with O3 to form the more poisonous nitrogen dioxide (NO2). NO2 may react with water vapor in air to form HNO3. This acid combines with NH3 to form ammonium nitrate. Fossil fuel combustion also contributes to oxides of nitrogen. About 95% of the nitrogen oxide is emitted as NO and remaining 5% as NO2. In urban areas about 46% of oxides of nitrogen in air comes from vehicles and 35% from electric generation and the rest from other sources. (i) Nitrous oxide (N2O):This gas has so far not been implicated in air pollution problems. The concentration of N2O remains more or less constant up to the troposphere and then decreases with increase in altitude. (ii) Nitric oxide (NO) : The chief source of this gas are the industries manufacturing HNO3 and other chemicals, and the automobile exhausts. At high temperature, combustion of gasoline produces this gas. A large amount of this is readily converted in to more toxic NO2 in the atmosphere by a series of chemical reactions. NO is responsible for several photochemical reactions in the atmosphere, particularly in the formation of several secondary pollutants like PAN, O3, carbonyl compounds etc. in the presence of other organic substances. (iii) Nitrogen dioxide (NO2) : It is a deep reddish brown gas, which is the only widely prevalent colored pollutant gas. This gas is the chief constituent of photochemical smog in metropolitan areas. At lower concentrations plant absorb NO and NO2 from air without any damage. The uptake rate of NO2 is much greater than that of NO. Concentrations of NO2 in access of 2mg/kg of air causes leaf damage to sensitive plants. In some plants, photosynthetic activity is impaired at a concentration of 0.6 mg/kg. In high concentrations, the oxides of nitrogen cause irritation to the mucus membrane and damage to the respiratory system. 5. Photochemical Products: The important photo chemical products which are produced in the atmosphere as a result of interlinking of oxides of nitrogen, hydrocarbons and ozone in the presence of light include Olefins, aldehydes, ozone, PAN and photochemical smog. Olefins are produced directly form the exhaust and in the atmosphere from ethylene. At very low concentrations of few ppb, they affect plants seriously. They wither the sepals of orchid flowers, retard the opening of carnation flowers and may cause dropping of their petals. At high levels they retard the growth of tomatoes. Aldehydes as HCHO and olefin, acroleins irritate the skin, eyes and upper respiratory tract. Photochemical smog : It was first discovered in Los Angeles, USA and is, therefore, also called Los Angeles Smog. When the air pollutants such as hydrocarbons and nitrogen oxides react with one another in the presence of sun light, NO2 , ozone and a compound called PAN (peroxyacetyl nitrate)- photochemical smog is formed which appears as a yellowish brown haze. The term smog is used for mixture of smoke and moisture in the air. The key reactant is NO2. The important hydrocarbons for the production of this smog are olefins. The major changes that occur in atmosphere are that hydrocarbons and NO are discharged in to the atmosphere from automobile exhaust in large amounts in the peak activity hours of day. With increasing intensity of solar radiations, the concentration of NO goes on decreasing, the concentration of NO2 increases and so does the amount of aldehydes. Then a decrease in NO2 concentration later in the day accompanies the occurrence of significant ozone concentration, which from mid day to afternoon goes on increasing along with aldehydes and hydrocarbons. Similar photochemical reactions between oxides of nitrogen and hydrocarbons result in the formation of Peroxy Acetyl Nitrate (PAN). Photochemical smog adversely affects plants, human health and materials. The oxidants enter as part of inhaled air, and alter, impair or interfere with respiratory process and other processes. Serious outbreaks of smog occurred in Tokyo, New York, Rome and Sydney in 1970, causing spread of disease as asthma and bronchitis in epidemic form. Tokyo-Yokohama asthma occurred in 1946 in some American soldiers and families living in smoggy atmosphere of Yokohama, Japan. Another serious disease caused by smog is emphysema, a disease due to structural breakdown of alveoli of lungs. The total surface area available for gaseous exchange is reduced and this cause severe breathlessness. The smoke and the particulate matters (fog, mist, dust, soot etc) in the smog reduce the visibility, damage crops and livestock, and cause corrosion of metals, stones, building materials, painted surfaces, textile, paper, leather etc. 6. Particulate Matter: This is a discrete mass of any material, except pure water, that exists as liquid or solid in the atmosphere and is of microscopic or submicroscopic dimensions. Air borne matter results not only from direct emission of particles but also from emissions of some gases that condense as particles directly or undergo transformation to form particle. Thus particulate matter may be primary or secondary. Primary particulate matter includes dust, as a result of wind, or smoke particles emitted from some factory, Atmospheric particulate matter range is size from 0.001 m to several hundred m. Particulate matter in atmosphere arises from natural as well as man-made sources. Natural sources are soil and rock debris (dust), volcanic emission, sea spray, forest fires and reactions between natural gas emission. There are four types of sources of particulate matter: (i)fuel combustion and industrial operations (mining, smelting, polishing, furnaces and textiles, pesticides, fertilizers and chemical production), (ii) industrial fugitive processes (materials handling, loading and transfer operation), (iii) non-industrial fugitive processes (roadway dust, agricultural operations, construction, fire etc.) and (iv) transportation sources (vehicle exhaust and related particles from fire, clutch and break wear). In our country, there is much of flyash introduced to atmosphere from fossil fuel based plants chiefly thermal power plants. They also emit coal dust. Besides them stone-crushers introduce smoke and dust in the atmosphere. The particulate matter is injurious to health. Soot, lead particles form exhaust, assents, flyash, volcanic emission, pesticides, H2SO4, mist metallic dust, cotton and cement dust etc when inhaled by man cause respiratory diseases such as tuberculosis, and cancer. In addition to the above there are also many kinds of biological particulate matter that remain suspended in atmosphere. These are bacterial cells, spores, fungal spores, and pollen grains. These cause bronchial, allergy and many other diseases in man, animals and plants. 7. Acid Rains: The oxides of sulphur and nitrogen are important gaseous pollutants of air. These two react with water in the atmosphere producing sulphuric acid and nitric acid. These oxides are swept up into the atmosphere and can travel thousands of kilometers. The longer they stay in the atmosphere, the more likely they are to be oxidized into acids. These come down to the earth along with rain. The pH of acid rain may vary from 3 to 6. Natural rains are slightly acidic because rain water reacts with CO2 in atmosphere and produces a weak acid, the carbonic acid. The acid rains contain sulphuric acid, nitric acid along with carbonic acid. Effects of acid rains: (i) Acid rain makes the leaves of plants yellow and brown and accelerates senescence. Thus affecting the productivity of forests, grasslands and crops. ii) It affects the properties of soil, changes the distribution of organisms in it and causes damage to soil fertility. i) It kills aquatic life forms and affects the productivity of aquatic ecosystems. ii) It leads to respiratory and skin diseases. iii) It damages marble and lime stone monuments. 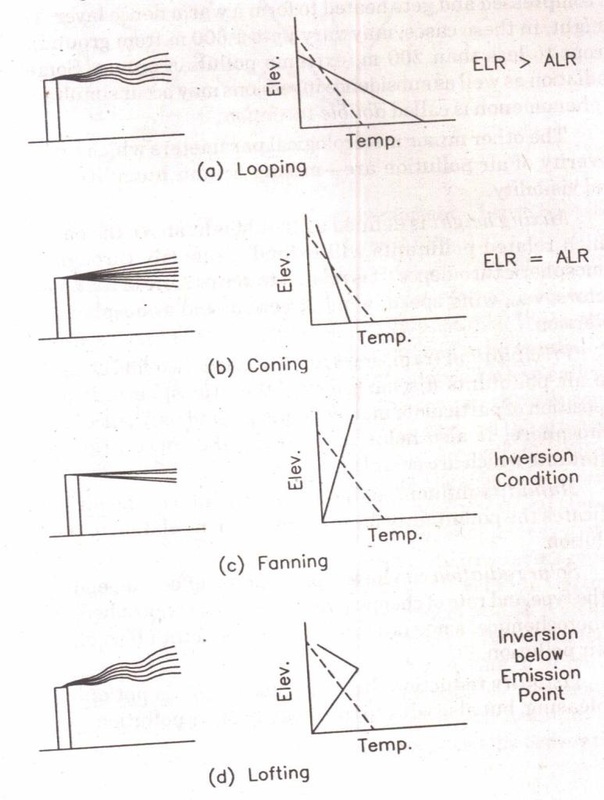 absorption of UV-radiations. The atmospheric ozone is now being regarded as potential danger to human health and crop growth. The temperature decreases with increasing altitude in the troposphere (8 to16 km. from earth surface), while it increase with increasing altitude in the stratosphere (above 16 km. up to 50 km). This rise in temperature in stratosphere is caused by the ozone layer. The ozone layer has two important and interrelated effects. Firstly, it absorbs UV light and thus protects all life on earth from harmful effects of radiation. Second, by absorbing the UV radiation the ozone layer heats the stratosphere, causing temperature inversion which limits the vertical mixing of pollutants, thereby causing the dispersal of pollutants over the large areas near the earth surface. It is why a dense clouds usually hang over the atmosphere in highly industrialized areas causing several unpleasant effects. The wastes spread horizontally relatively fast (than slow mixing vertically), reaching all longitudes of the world in about a week and all latitudes within months. There is, therefore, very little that a country can do protect the ozone layer above it. The ozone problem is thus global in scope. In spite of slow vertical mixing, some of the pollutants (CFCs) enter the stratosphere and remain there for years until they are converted to other products or are transported back to the stratosphere. The stratosphere could be regarded as a sink, but unfortunately, these pollutants (CFEs) react with the ozone and deplete it. The ozone near the earth‟s surface in the troposphere creates pollution problems. Ozone and other oxidants such as peroxy acetyl nitrate (PAN) and hydrogen peroxide are formed by light dependent reactions between NO2 and hydrocarbons. Ozone may also be formed under UV-radiation effect. These pollutants cause photochemical smog. Increase in O3 concentration near the earth‟s surface reduces crop yields significantly. It also has adverse effect on human health. Thus, while higher levels of O3 in the atmosphere protects us, it is harmful when its comes in direct contact with us and plants at earth‟s surface. In plants, O3 enters through stomata. It produces visible damage to leaves, and thus a decrease in yield and quality of plant products. At 0.02 ppm it damages tobacco, tomato, bean, pine and other plants. Ozone alone and in combination with other pollutants like SO2 and NOx is causing crop losses of over 50% in several European countries. In Denmark, O3 affects potato, clover, spinach, alfalfa etc. In limited pockets O3 concentration can be potentially harmful. For instance, in West Germany 100-250 g/m3 O3 is not uncommon. In the Netherlands, O3 concentration was high enough to reduce yields of potato, beans and poplars. In several locations in U.K., O3 concentration exceeded 400 g/m3 in 1976. Ozone also reacts with many fibers especially cotton, nylon and polyester, and dyes. The extent of damage appears to be affected by light and humidity. O3 hardens rubber. A concentration of 0.3ppm causes nose and throat irritation, 1-3 ppm causes extreme fatigue while a concentration of 9.0 ppm causes severe pulmonary edema. O3 is intimately connected with the life-sustaining process. Any depletion of ozone would, therefore, have catastrophic effects on life systems of the earth. Over the last few years, it could be realized that the O3 concentration of earth's atmosphere is thinning out. What has caused this depletion? In stratosphere, ozone absorbs UV rays causing the temperature inversion. This temperature inversion limits the vertical mixing of pollutants. However, in spite of this slow vertical mixing, some pollutants enter the stratosphere and remain there for years until they react with ozone and converted to other products. These pollutants thus deplete ozone in the stratosphere. Major pollutants responsible for this depletion are chlorofluorocarbons (CFCs), nitrogen oxides (coming from fertilizers) and hydrocarbons. CFCs are widely used as coolants in air conditioners and refrigerators, cleaning solvents, aerosol propellants and in foam insulation. CFC is also used in fire extinguishing equipment. They escape as aerosol in the stratosphere. Jet engines, motor vehicle, nitrogen fertilizers and other industrial activities are responsible for emission of CFCs, NOx etc. The supersonics air crafts flying at stratosphere heights cause major disturbances in O3 levels. The threat to ozone is mainly from CFCs, which are known to deplete O3 by 14% at the current emission rate. On the other hand NOx would reduce O3 by 3.5%. The nitrogen fertilizers release nitrous oxide during de-nitrification. Depletion of O3 would lead to serious temperature changes on the earth and consequent damage to life support system. Depletion of ozone in stratosphere causes direct as well as indirect harmful effects. Since the temperature rise in stratosphere is due to heat absorption by ozone, the reduction in ozone would lead to temperature changes and rainfall failures on earth. Moreover one per cent reduction in O3 increase UV radiation on earth by 2%. A series of harmful effects are caused by an increase in UV radiation. Cancer is the best-established threat to man. When the O3 layer becomes thinner or has holes, it causes cancers, especially relating to skin like melanoma. A 10% decrease in stratospheric ozone appears likely to lead a 20-30% increase in skin cancer. The other disorders are cataracts, destruction of aquatic life and vegetation and loss of immunity. Nearly 6,000 people die of such cancers in USA each year. A 7% increase in such case has been reported from Australia and New Zealand. discovered hole in South Pole. British team discovered a hole in ozone layer as large as that of the United States. This was followed by Montreal Protocol in 1987, which called for a 50% cut in the use of CFCs by 1998 reducing it to the level of 1986. Many countries including India did not sign the Protocol. India did not see any rationale as its release of CFCs is just 6,000 tones a year, equivalent to one and a half day‟s of world total. In our country per capita consumption of CFC is 0.02 kg. against 1 Kg. of developed world. CFCs are mainly the problem of developed world, as 95% of CFCs is released by European counties, U. S. A, USSR and Japan. USA alone releases 37% CFCs (producing CFC worth 2 billion dollar). The three-day international conference on Saving the ozone layer was organized jointly in London in March 1989 by the British Government and the UNEP. This conference highlighted the global problem created by the developed world, which in turn, is trying to dictate its terms to the developing countries for CFC pollution. The Montreal Protocol was initially signed by 31 countries. There was held another international conference on ozone at Helsinki in May 1989 to revise the Montreal protocol. As many as 80 nations agreed to have a total ban on chemicals that cause ozone depletion by 2000 A.D. However, the conference backed away from a plan put forward by Dr. Mostafa Tolba, Executive Director, UNEP to set up an international climate fund. While the developing countries preferred to have the fund, the developed ones, including Japan, USA and UK rejected the plan. The life time of ozone is typically a few days to two months, and its global distribution is highly variable in time and space. The best O3 data sets are from the last 20 years or so, during which time O3 measurements were integrated into programmes at sites in the Global Atmosphere Watch (GAW). The world data center for surface ozone has recently become operational (1998). Automobile exhaust contains a variety of hydrocarbons. These are emitted by evaporation of gasoline through carburetors, crankcase etc. The decomposition of organic waste and garbage also produces hydrocarbons like methane. From amongst many hydrocarbons, the chief air pollutants are benzene, benzpyrene and methane. In India, two and three wheelers are the main contributors, and in Delhi and Bangalore, emission form these accounts for about 65% of the total hydrocarbons. If unchecked, this may go up to 80% of the total hydrocarbons of air. About 40% of the vehicular exhaust hydrocarbons are unburned fuel components, the rest are the product of combustion. They have carcinogenic effects on lung. They combine with NOx under UV-component of light to form other pollutants like PAN and Ozone (photochemical smog) which cause irritation of eye, nose and throat, and respiratory distress. charcoal boiled stakes, and gasoline exhaust. Methane (marsh gas) is a gaseous pollutant, in minute quantity in air, about 0.0002% by volume. In nature this is produced during decay of garbage, aquatic vegetation etc. This is also released due to burning of natural gas and from factories. Higher concentrations may cause explosion. The excess of water seepage in filled up well and pits may lead to excess production of methane, which bursts with high sound and may cause local destruction. At high levels in absence of oxygen, methane may be narcotic on man. Fluorocarbons, in minute quantities are beneficial, helping prevention of tooth-decay in man but only in very minute amounts. However, higher levels become toxic, In India, there is a problem of fluorosis, as also in other countries as USA, Italy, Holland, France, Germany, Spain, Switzerland, China, Japan and some African and Latin American countries. In our country, it is a public health problem in states of Gujarat, Rajasthan, Punjab, Haryana, Uttar Pradesh, Andhra Pradesh, Tamil Nadu, Karnataka and some areas of Delhi. Fluorides in atmosphere come from industrial processes of phosphate fertilizers, ceramics, aluminum, fluorinated hydrocarbons (refrigerants, aerosol propellants etc. ), fluorinated plastic, uranium and other metal. The pollutant is in gaseous or particulate state. In particulate form it is deposited near the vicinity of emission, whereas in gaseous form it disperses over large areas. On an average fluoride level of air is 0.05 mg/m3 of air. Higher values may also reach as in some Italian factories as much as 15.14 mg/m3 of air. Resident of this area inhales about 0.3 mg/m3 of fluoride daily. In air, fluoride chiefly comes from smoke of industries, volcanic eruptions and insecticide sprays. Fluorides enter leaves of conifers. Fluoride pollution in man and animals is mainly through water. The common metals which cause air pollution are mercury, lead, zinc and cadmium. They are released from industries and by human activities in the atmosphere. Mercury, a liquid volatile metal is present in air as a result of human activities as the use of mercury compounds in production of fungicides, paints, cosmetics, paper pulp etc. It has been reported that inhalation of 1 mg Hg/m3 of air for three months may lead to death. Nervous system, liver, eyes are damaged. Infants may be deformed. Other symptoms of mercury toxicity, are headache, fatigue, anxiety, lethargy, loss of appetite etc. compounds also damage RBCs resulting in infection of liver and kidney in man. In automobiles lead accumulation increase emission of hydrocarbons. Zinc, not a natural component of air, occurs around zinc smelters and scrap zinc refineries. Copper, lead and steel refineries also release some zinc in the air. Zinc in air occurs mostly as white zinc oxide fumes and is toxic to man. Cadmium occurs in air due to industrial and other human activities. Industries engaged in extraction, refining, electroplating and welding of cadmium containing materials, and those in refining of copper, lead and zinc are the major source of cadmium in air. Production of some pesticides and phosphate fertilizers also emits cadmium to air. This metal is emitted as vapor, and in this state it quickly reacts to form oxide, sulphate or chloride compounds. Cadmium is poisonous at very low levels and is known to accumulate in human liver and kidney. It causes hypertension, emphysema and kidney damages. It may turn to be carcinogenic in mammals. (i) Looping: This type of plume has a way shape, and it occurs in a highly unstable atmosphere when rapid mixing takes place. The high degree of turbulence helps in dispersing the plume rapidly, but high concentrations may occur near the stack if the plume touches the ground. (ii) Coning: It is a cone shaped, with horizontal axis, plume. It occurs in near neutral (stable) atmosphere when wind velocity is greater than 32 km/hr (i.e. windy conditions). However, the plume reaches the ground at a greater distance than looping plume. Also concentration is less, but it persists longer than the looping plume. (iii) Fanning: This type of plume is emitted under extreme inversion conditions. Under these conditions, the plume spreads horizontally (fan shaped) and there is very little vertical spreading for kilometers down – wind. It dispersed very slowly. (iv) Lofting: This type of plume is in the form of loops or cones with well-defined bottom. Lofting occurs when there is a strong lapse rate above a surface inversion. Under such conditions, diffusion is rapid upward, but downward diffusion does not penetrate the inversion layer. Under these conditions, emission will not reach the ground surface. It is considered to the best condition for dispersion because the pollutants are dispersed in the upper air with very little probability of ground contact. (v) Fumigation: It is a phenomenon, when pollutants (that are aloft in the air) are brought rapidly to ground level when the air destabilizes. The plume is in the form of a well-defined cone with dragged or diffused bottom. Under these conditions, the concentration is relatively high and the probability of ground contact is also very high. (vi) Trapping: This refers to conditions, when the plume is sand-witched between inversions and, thus, can only diffuse with in a limited vertical height. The lofting plume is the most favorable with regard to minimizing air pollution. While, the fumigating and trapping plumes are very critical for ground level pollution concentrations point of view. Observation of smoke plumes is useful in determining the location at which the air samples should be taken. The knowledge of characteristics of plume is also helpful in dealing with the invisible pollutants. Industries make a mjor contribution towards causing air pollution. Formation of pollutants can be prevented and their emission can be minimized at the source itself. By carefully investigating the early stage of design and development in industrial process e.g., those methods which have minimum air pollution potential can be selected to accomplish air-pollution control at source itself. used instead of traditional high contamination fuels such as coal. at power plants can be reduced. furnaces are replaced with controlled basic oxygen furnaces or electric furnaces. Occasionally Pollution control at source is not possible by preventing the emission of pollutants. pollutants from the main gas stream. source increase they become diluted by diffusion with environmental air. Dilution of the contamination in the atmosphere is another approach to the control of air pollution. If the pollution source release as these pollutants easily diffuse into the atmosphere but if the quantity air contaminants is beyond the limited capacity of the environment to absorb the contaminants then pollution is caused. However, dilution of the contaminants in the atmosphere can be accomplished through the use of tall stacks which penetrate the upper atmosphere layers and disperse the contaminants so that the ground level pollution is greatly reduced. The height of the stacks is usually kept 2 to 2 ½ times the height of nearby structures. Dilution of pollutants in air depends on atmospheric temperature, speed and direction of the wind. The disadvantage of the method is that it is a short term contact measure which in reality brings about highly undesirable long effects. This is so because dilution only dilutes the contaminants to level at which their harmful effects are less noticeable near their original sources whereas at a considerable distance form the source these very contaminants eventually come down in some form or another. Plants contribute towards controlling air pollution by utilizing carbon dioxide and releasing oxygen in the process of photosynthesis. The purifies the air (removal of gaseous pollutants- CO2) for the respiration of men and animals. Gaseous pollutants like carbon monoxide are fixed by some plants, namely, Coleus, Blumeri, Ficus variegate and Phascolus vulgaris. Species of Pinus, Quercus, Pyrus, Juniperus and Vitis depollute the air by metabolizing nitrogen oxides. Plenty of trees should be planted especially around those areas which are declared as high – risk areas of pollution. This method of controlling air pollution can be adopted at the planning stages of the city. Zoning advocates setting aside of separate areas for industries so that they are far removed form the residential areas. The heavy industries should not be located too close the each other. New industries, as far as possible, should be established away form larger cities and the locational decision of large industries should be guided by regional planning. The industrial estate of Banglore is divided into three zone namely light, medium and large industries. In Banglore and Delhi very large industries are not permitted. The adverse effect on the natural environment, including human, animal or plant life, of a harmful substance that does not occur naturally. E.g. industrial or radioactive waste or the construction to harmful levels of naturally occurring substances e.g. nitrates. Biologists define pollution as and undesirable change in the physical, chemical or biological characteristics of an ecosystem. This means that pollution injurious for organisms or it make part of the ecosystem unfit for the use we want to make it, e.g. as when water is polluted it can no longer be used for drinking, recreation or industrial process. A pollutant is regarded to be an undesirable or deleterious modification of the environment. The modification may actually or potentially influence human life, living condition, cultural assets or the life cycles of indigenous plant or animals communities that inhabit a given system. The sings of water pollution have obvious to even the most casual observer, e.g. drinking water tastes bad, masses of aquatic week are growing unchecked in water bodies emit disgusting orders. The sources of water on this planet are rain, surface water, the ground water and the sea. Rain water carries the washed out minerals, salts and organic matter from the earth‟s surface and is stored in ponds, lakes and rivers. It percolates underground and is stored there as ground water. The source of fresh water are ponds, wells, lakes and rivers. Natural water contains numerous organisms like phytoplankton, zooplanktons, fish and so on. Besides it is a good solvent and contains dissolved gases like oxygen. When we say pure water, we mean water free from organisms, particularly microbes, and which usually contains a negligible amount of salts. In India, the ever increasing population, urbanization, agricultural activities and industrialization, accompanied by a greater mechanization in every sector of life, has led to a constant increase in requirements placed upon water. It has been estimated that 70% of available water in India is polluted. The signs of water pollution have been obvious to even the most casual observer. However, water pollution may be defined as “the addition of any substance to water or changing of it‟s physical and chemical characteristics in any way, which interferes with its use for legitimate purposes”. Thus, pollution of natural water implies that it contains a lot of inorganic substances introduced by human activities, which change its quality and are harmful for many living organisms, including man. It is one of the most serious problems in the world, particularly in developing countries. Normally water is never pure in a chemical sense. It contains impurities of various kinds-dissolved as well as suspended. These include dissolved gases (H2S, CO2, NH3, N2), dissolved minerals (Ca, Mg, Na salt), suspended matter (clay, silt, sand) and even microbes. These are natural impurities derived from atmosphere, catchments areas and the soil. They are in very low amounts and normally do not pollute water and it is potable. Polluted water, however, is turbid, unpleasant, bad smelling, unfit for drinking, bathing, and washing or other purposes. They are harmful and are vehicles of many diseases as cholera, dysentery, typhoid etc. 1. Oxygen demanding waste: Dissolved oxygen has been a fundamental requirement of life in any given body of water. A body of water is classified as polluted when the DO concentration drops below the level necessary for sustaining normal biota for that water. The primary cause of water degradation has been the presence of substances collectively called oxygen demanding wastes. These are primarily organic materials that are oxidized by bacteria to carbon di -oxide and water. Sewage is the waterborne waste derived from home (domestic waste ) and animals or food processing plants. Sewage and other oxygen demanding wastes have been classified as water pollutants because their degradation leads to oxygen depletion. This affects the aquatic life, impairs domestic and livestock water supplies by affecting taste, odors and colors. It includes human excreta, paper, cloth, soap, detergents etc. There is uncontrolled dumping of wastes of rural areas, towns and cities into ponds, lakes, stream or rivers. The decomposition of these wastes by aerobic microbes decrease due to higher levels of pollution. The self-purifying ability of the water is lost and water becomes unfit for drinking and other domestic uses. Since decomposition of sewage and other wastes is largely an aerobic process, accumulation of these in water increase its oxygen requirements (BOD). Phosphates are the major ingredients of most detergents, They favor the luxuriant growth of algae which form water blooms. This extensive algae growth also consumes most of the available oxygen from water. This decrease in level becomes detrimental to growth of other organisms, which produces a foul smell upon decay. One of the most common primary sources of water pollution is the discharge of untreated or partly treated sewage in water bodies, sometimes due to improper sewage-handling processes of municipal bodies. As oxygen demanding wastes rapidly deplete the DO of water, it is important to estimate the amount of these pollutants in a given body of water. The biochemical oxygen demand (BOD) of water has been a quantity related to the amount of wastes present. Biological oxygen demand (BOD): In a water sample the BOD indicates the amount of dissolved oxygen used up during the oxidation of oxygen demanding wastes. BOD is the amount of oxygen required for biological oxidation by microbes in any unit volume of water. It could be found out by incubating a sample of water for five days at 20 C. A BOD value generally approximates the amount of oxidisable organic matter, and is, therefore, used as a measure of degree of water pollution and waste level. Thus mostly BOD value is proportional to the amount of organic waste present in water. BOD values are thus useful in evaluation of self-purification capacity of a water body and for possible control measure of pollution. The quantity of oxygen in water (Dissolved Oxygen –DO) along with BOD is indicated by the kind of organisms present in water. Thus fish become rare at DO value of 4 to 5 ppm of water. Further decrease in DO value may lead to increase in anaerobic bacteria. A BOD of 1ppm has been characteristic of nearly pure water. Water is regarded as fairly pure with a BOD of 3ppm, and of doubtful purity when the BOD value reaches 5ppm. Eutrophication: In natural conditions relatively small quantities of nutrients and sediments are leached or eroded from the land into water bodies. In turn these are fed by clear rivers and streams, the natural conditions of lakes and esturies is generally oligotrophic, that is the water is nutrient poor. This limits the growth of phytoplaktons, but benthis plants (plants that grow attached to or rooted in the bottom) thrive to a depth of 30 feet. Oxygen from the atmosphere is very slow to dissolve and get mixed with water. Benthic plants also help in maintaining the dissolved oxygen level in deeper water because oxygen produced during photosynthesis is directly dissolved into the water. Thus a nutrient poor water body maintains a rich and diverse ecosystem. With the erosion and leaching of materials, a water body gradually gets filled with sediments and gets enriched with nutrients. The nutrient enrichment promotes the growth of phytoplanktons which in turn make the water more turbid this problem is more compounded by sediments. The oxygen produced by photosynthesis of phytoplanktons supersaturates the upper water and escapes the surface. Phytoplankton has a high turnover rate leading to an unusually high accumulation of detritus. As decomposers mainly bacteria feed on this material, they also consume oxygen in their respiration, thus depleting the dissolved oxygen in the water. When DO is not available the bacteria shift and continue to thrive on fermentation. As a consequence, the DO becomes high at surface level whilebecomes almost zero at lower levels. Thus the lake becoming a eutrophic lake. Thus eutrophication is nutrient enrichment that promotes the growth of phytoplankton in the water body. In USA, Lake Erie is an excellent example of eutrophication due to man made problems. In 1965, there were added more than 80 tons of phosphates daily in the lake. Each 400 g of PO4 encourages about 350 tones of algal slime. Due to this algal growth on the shores of lake appeared as big mounds producing unpleasant odor, clogging pipes and interfering with fishing and navigation. Eutrophication is thus limiting factor in supply of clean water for drinking fishing and navigation etc. by industrial wastes and effluents which come along waste waters of different industries such as petrochemicals, fertilizer factories, oil refineries, pulp, paper textiles, sugar and steel mills, tanneries, distilleries, synthetic material plants for drugs, fibers, rubbers, plastics etc. 3. 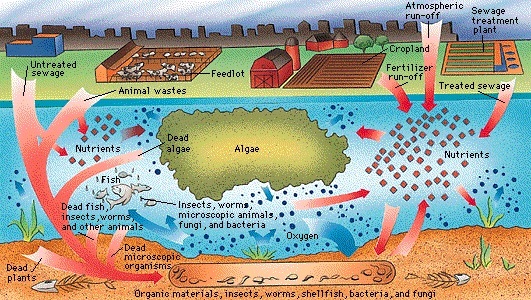 Agricultural discharges : It includes sediments, fertilizers, pesticides and farm animal wastes. All these pollutants can enter waterways as run off from agricultural lands but farm animal wastes are an especially large problem near the large feed lots on which thousands of animals concentrated. Their discharge reach into the water bodies. As compared to developed nations, India has a relatively low use of chemicals, thus discharge into water are still low. India uses about 16Kg/ha of fertilizers (chemicals) on an average, whereas the world average is 54 Kg/ha. Thus it is not only the increased use but also escalated production that would enhance pollution. (a) Artificial fertilizers: Modern agriculture relies heavily on a wide range of synthetic chemicals which include different types of fertilizers and biocides (pesticide, herbicides or weedicides). These chemicals along with wastes are wasted off lands through irrigation, rainfall, drainage etc. reaching into the rivers, lakes, stream etc. where they disturb the natural ecosystem. How dangerous are they? Are they harmful? Do they benefit? Are they safe? What to use? Which to use? While improving the yield do these chemicals in any manner affect the quality of the food stuffs grown? Artificial fertilizers crowd out useful minerals naturally present in the topsoil. The microbes (bacteria, fungi, worms etc.) in topsoil enrich the humus and help to produce nutrients to be taken up by the plant and later by animals. But fertilizers enriched soil can not support microbial life and hence there is less humus and less nutrients and the soil can easily become poor and eroded by wind and rain. Chemical fertilizers are made up of only a few minerals. Thus they impede the uptake of other minerals and imbalance the whole mineral pattern of plant body. Many crops today lack potassium due to excessive use of nitrogenous fertilizer. Excessive potash treatment decreases valuable nutrients in foods, such as ascorbic acid (Vitamin C) and carton. Liming can prevent the release and uptake into the plants of cobalt, nickel, manganese and zinc. Super-phosphate may lead to a copper and zinc deficiency. Plants also become less resistant to diseases. NO3 fertilizers increase the total crop yield (carbohydrates) but at the expense of protein. Corn and wheat grown on soil fertilized with N, P, and K showed a 20-25% decline in protein content and increase in carbohydrate content. Moreover, subtle balance of amino acid is disturbed within the protein molecule, thus lowering protein quality. Since most of Indians are vegetarians, consumption of low quality protein leads to malnutrition. Fertilizer use produces over-sized fruits and vegetables, which are more prone to insects and other pests. According to H. H. Koepf, an eminent soil chemist, modern agriculture can honestly claim only two notable crops-“disease and pests”. To this we can now add a third- poison (as nitrites, nitrates). Nitrate fertilizers used on soil enter our wells and ponds, making their water very rich in nitrates. It not only makes water unfit for drinking but also causes disease. This water when taken by us, the nitrates are converted to nitrites by microbial flora of intestine. These nitrites then combine with the hemoglobin of blood to form methaemoglobin, which interfaces with the O2-carrying capacity of the blood. The disease produced in called Methaemoglobinaemia. This leads to various ailments, damage to respiratory and vascular system, blue coloration of skin and even cancer. A healthy person contains 0.8% of methaemoglobin, whereas in methaemoglobinaemia this level reaches to 10% in the blood. At above 30% concentration there occurs headache, giddiness and above 60%, un-consciousness with stiffness and ocular problem etc takes place. At 80% death occurs. Nitrate poisoning is frequent in Rajasthan due to hard and saline water. Several children have died due to this problem. In 1976, there were cases of NO3 poisoning of cattle in Nagpur. In Rajasthan NO3 levels in water area very high, (800 mg/l), which is much beyond the permissible concentration of 45 mg/l by WHO. Consumption of vegetable grown in NO3 rich soil may also lead to this disease, especially in sick persons and children. Addition of phosphates and NO3 to water leads to depletion of oxygen due to excessive algal growth. It leads to death of fish and other aquatic life. (b) Pesticides and biocides : Pesticides are the chemicals used for killing the plant and animals pests. It is a general term that includes bactericides, fungicides, nematicides, insecticides and also the herbicides or weedicides. Since weeds (herbs) are not pests like bacteria, fungi, nematodes, insects, the spectrum of activity of these chemicals is extended beyond the pest; and thus a broader term biocide is used to include also herbicides etc. A wide range of chemicals is used as biocides. But the most harmful are those, which either do not degrade or degrade very slowly in nature. We prefer to distinguish such chemical substances as hazardous substance or toxicants. These are highly potent chemicals that enter our food chain and then begin to increase in their concentrations at successive trophic levels in the food chain. Equally hazardous substances are the radionuclides. The hazardous biocides cause considerable harm since their effects are cumulative. Most nations have banned the use of some of these biocides. The long range effects of such biocides are infact a threat to our ecological security. According to Pearson (1985) pesticide related deaths in developing countries are estimated at 10,000/year and about 1.5-2 million person suffer from acute pesticide poisoning. our biological, geological and chemical cycles of the earth. They are everywhere in same form. Measurable amounts of DDT residues may be found in air, soil, and water and at several thousand of Kms. from the point where it had originally entered the ecosystem. For instance if DDT enters a pond, lake, it is taken as such by the plants of the pond, then reaches to zooplankton feeding on plants, then to minnows eating the zooplanktons, then to fish which eats the minnows and finally in the body of birds who eat the fish. Not only DDT as such in its original form keeps on moving form water to different living components of the pond system but more threatening is that –DDT concentration continuously increases in successive trophic levels (various form of living organisms) in a food chain. This phenomenon is known as biological magnification or biological amplification. This is the reason why our food grains as wheat, rice, vegetables and fruits today contain varying amounts of pesticide residues, which have become their integral part. They can not be removed by washing or other means. Besides DDT there are also heavy metals like lead, mercury, copper which also show similar behavior in a food chain. Similarly the radionculides as storntium-90 follows biological magnification. We shall present more details of these processes in separate chapter on Toxicology. The outcome of such criminal and indiscriminate use may be acute (immediate) or chronic poisoning. The danger of long term consumption of pesticides residues in food is far more serious that acute poisoning from the point of view of national health. Children born today have to start life with a body burden of pesticides, which increase with age. There is evidence that such chronic accumulation of pesticides played a role in kidney malfunctioning, excess of amino acids in blood and urine, electroencephalogram abnormalities of brain tissue, blood abnormalities etc. 4. Solid waste pollution: Solid waste varies in composition with socioeconomic status of the generating community. The disposal of solid waste poses many problems, depending upon both the types of waste and the disposal method employed. The majority of waste classified as combustible- rubbish, garbage and sewage sludge is disposed off by incineration, using it as land fill or disposal by ocean dumping. Landfill and ocean dumping lead to water pollution. 5. Thermal pollution: Thermal pollution takes place because many electricity generating companies use water in the process of cooling their generators. This heated water is then released into the system from which it was drawn, causing a warming trend of the surface waters. Thermal pollution results when the heated effluent is released into poorly flushed systems. In these cases a permanent temperature increase often results, which tends to decrease the solubility of dissolved oxygen in the waterbody and is thus very injurious to aquatic life. 6. Radioactive Waste Pollution: The major sources of radioactive wastes have been nuclear explosives, accidents at nuclear power plants, fuel reprocessing plants and research laboratories and hospitals that release these wastes into the atmosphere or into waste water. Out of total fresh water present on the earth, 98% lies below its surface. The remaining 2% is available in the form of rivers, streams, ponds and lakes. Ground water occurs in saturated materials below the water table. It acts as a reservoir by virtue of large pore space in earth materials, as a conduit which can transport water over long distances and as a mechanical filter which improves water quality by removing suspended solids and bacterial contaminants. (a) Domestic waste: This includes pathogenic organisms, nutrients and solids and also the oxygen demanding materials. (b) Industrial wastes: These include toxic heavy metals along with organic and inorganic hazardous materials. The industries of woolens, bicycles in areas of Punjab contribute high amount of Ni, Fe, Cu, Cr and cyanides to ground waters. (c) Agricultural wastes: Many fertilizers, pesticides and insecticides added to the soil to improve its fertility and protect the crops from pests and rodents find their ultimate way in to the ground water thus pollute it. Similarly processing waste and animal wastes are also added to the water. Leachets from agricultural land containing nitrates, phosphates and potash move downward with percolating water and ultimately get mixed with ground water thus polluting it. (d) Seepage pits, Urban and rural garbage, waste water treatment lagoons are some pther potential sources of underground water pollution. (a) It is a major cause of spreading epidemics and chronic diseases like typhoid, cholera, dysentery and diarrhoea etc. in human beings. (b) Contaminents like asbestos are responsible for causing fatal diseases like asbestosis and lung cancer. (c) Ground water in excessive rainfall areas contains iron toxic amounts. (d) Cropsirregated with polluted ground water get severely damaged and productivity of grains also decreases. (e) Soil fertility is also affected by ground water pollution. (f) Plant metabolism is also affected. Marine Pollution: Discharge of waste substances into the sea resulting in harmful effects to living resources, hazardous to human health, hinderance to fishery and imparement of quality for use of sea water is called as marine pollution. It is associated with the change in physical, chemical and biological conditions of the sea water. All that what is carried by rivers ultimately ends up in the seas. On their way to sea, rivers receive huge amounts of sewage, garbage, agricultural discharge, biocides, including heavy metals. These all are added to sea. Besides these discharges of oils and petroleum products and dumping of radionuclieds waste into sea also cause marine pollution. Huge quantity of plastic is being added to sea and oceans. Over 50 million lb plastic packing material is being dumped in sea of commercial fleets, whereas over 300 million lb entering through inland waterways in USA. Many marine bird ingest plastic that causes gastro-intestinal eggshgel and tissue damage of egg. Radionucilde waste in sea includes Sr-90, Cs-137, Pu-239, Pu-240. The pollutants in seas may become dispersed by turbulence and ocean currents or concentrated in the food chain. They may sediment at the bottom by processes like adsorption, precipitation and accumulation. Bioaccumulation in food chain may result into loss of species diversity. The pollution in Baltic sea along the coast of Finland, took place largely from sewage and effluents form bottom fauna. There was seen distinct zonation with extent of pollution. In clear or less polluted water there was rich species diversity which tended to decrease with increasing pollution load. In heavily polluted area, macroscopic benthic animals were absent, but chironomid larvae occurred at the bottom. In marine water the serious pollutant is oil, particularly when afloat on sea. An spill in oil or petroleum product due to accidents or a deliberate discharge of oil polluted waste brings about pollution. About 285 million gallons of oil are spilled each year into ocean, mostly from transport tankers. This is enough to coat a beach 20 feet wide with half and inch oil layer for 8633 miles. About 50,000 to 250,000 birds are killed every year by oil. The oil is soaked in feathers, displacing the air and thus interfere with buoyancy and maintenance of body temperature, Hydrocarbons and benzpyrene accumulate in food chain and consumption of fish by man may cause cancer. Detergents used to clean up the spill are also harmful to marine life. chloride producing plant, using Hgcl2 as a catalyst. In Sweden many rivers and lakes are already polluted due to widespread use of mercury compounds as fungicides and algaecides in paper and pulp industries and in agriculture. Chloral alkali plants seem to be the chief source of mercury containing effluents. Paper and pulp industries of Japan and Canada also cause mercury pollution. Effluents of industries making switches, batteries, thermometers, fluorescent light tubes and high intensity street lamps also contain mercury. Mercury compounds enter the water body from the effluents and at their bottom these are metabolically converted into methyl mercury compounds by anaerobic microbes. Methyl mercury is highly persistent and thus accumulates in food chain. Methyl mercury is soluble in lipids and thus after being taken by animals it accumulates in fatty tissues. Fish may accumulate the methyl mercury ions directly. There may be nearly 3000 times more mercury in fish than in water. In Minamata bay all the mercury in sea food is as organic methyl mercury compounds. The symptoms of Minamata include malaise, numbness, visual disturbance, dyspepsia, ataxia, mental deterioration, convulsions and final death. Mercury readily penetrated the central nervous system of children born in Minamata causing teratogenic effects. Methyl mercury penetrates through placenta. Swedish fish eaters have high mercury content in blood. In Drosopial methyl mercury (0.25 ppm) treatment brought chromosomal disjunction in gametes. Mercury poisoning is caused due to inactivation of several sulfhydral enzymes by replacement of hydrogen atoms in sulfhydral groups. The antidote, BAL (dimercaprol) is used for mercury poisoning. Lead Pollution: Lead poisoning is common in adults. The chief sources of lead to water are the effluents of lead and lead processing industries. Lead toys may be chewed by children. Painters also have a risk of lead consumption. In some plastic pipes lead is used as stabilizer. The water may become contaminated in these pipes. Lead is also used in insecticides, food, beverage, ointments and medicinal concoctions for flavoring and sweetening. Lead pollution causes damage to liver and kidney, reduction in hemoglobin formation, mental retardation and abnormalities in fertility and pregnancy. Chronic lead poisoning may cause three general disease syndromes (I) gastrointestinal disorder (ii) neuromuscular effects (leadlapsy)- weakness, fatigue muscular atrophy, and (iii) central nervous system effects of CNS Syndrome –that may result to coma and death. Lead poisoning also causes constipation, abdominal pain etc. Rajasthan. This has already crippled about 3.5 lakh person in state. Fluorisis is prevalent in districts of Jodhpur, Bhilwara, Jaipur, Bikaner, Udazipur, Nagpur, Barmer and Ajmer. Many people in Rajasth have humped back due to high fluoride content in water sources and in arid and grains semi arid zones. In arid and semi-arid soils also fluroide content is very high. Food grains obtained from these soils are also rich in fluorides. Prolonged intake of fluoride containing water stiffens the bone joints, particularly of spinal cord. Fluoride is not absorbed in the blood stream. It has an affinity with calcium and thus gets accumulated in bones, resulting in the mottling of teeth, pain in the bones and joint and outward bending of legs from the knees-knock knee syndrome. Fluoride levels more than 0.5 ppm over a period of 5-10 years results in fluorisis terminating in crippling or paralysis. In water of most villages of Rajasthan fluoride level is higher than permissible limit of 1 mg/liter of water. Cattle grazing around fluoride sources, as ceramic rocks, phosphate fertilizer plants and aluminum factories often develop fluorisis. The toxic effects are staining, mottling and abrasion of teeth, high fluoride levels in bone and urine, decreased milk production, and lameness. Moreover, the animals also become lethargic. The word soil has been derived form the Latin word “Solum” meaning upper most crust of the earth. Soil is generally defined as upper layer of the earth differentiated into various horizons and capable of supporting plant life. Soil is a collection of natural bodies on the earth‟s surface containing living matter and supporting or capable of supporting or capable of supporting plants. Its upper limit is air or water and its lateral margins its grade to deep water or barren areas of rock or ice. Its lowest limit is most difficult to define but is normally through of as the lower limit of the common rooting depth or the native perennial plants, a boundary that is shallow in deserts and tundra and deep in humid tropics. Soil plays an important role for living beings. It is not only an home for microbes but also gives nutrition for plants. The process of soil formation is very slow which is due to the weathering of rocks. Good soil and favorable climate for productivity are valuable assest for any nation. But due to human activities, soil gets many pollution and pollutants by use of pesticides, fertilizers, soil erosion, particular matter from power plants smoke and stack etc. 1. 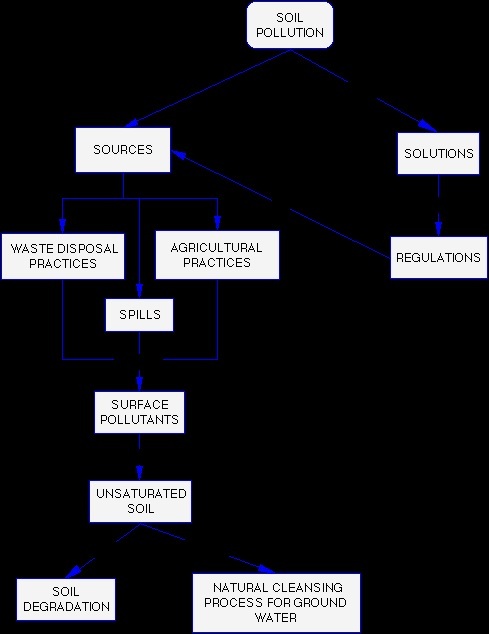 Agricultural Practices: Agricultural waste are common polluntats of soil as well as water pollution. Agro- chemicals such as fertilizer, pesticides, insecticides, weedicides cause land pollution, DDT, BHC etc. and chemicals like lead (Pb), mercury (Hg), arsenic (As), accumulate on the soil permanently. 3. Biological agents: Other important pollutants are the biological agents including various biological organism form human and animal excreta. In addition to excreta, faulty sanitation, waste water disposed etc. includes land as well as woil pollution. These also various diseases. Households refuse, industrial water, agricultural wastes are tipped on land. By these many chemicals undecided substances enter into surface and get mixed with ground water. Thee chemicals are harmful for living beings and affect plants and animals. Fungi, Bacteria, Protozoa, Viruses, Ascaris etc. 1- Industrial wastes: Disposal of industrial waste is the major reason for soil pollution. These industrial pollutants are mainly discharged from pulp and paper mills, chemical industries, oil refineries, sugar factories tanneries, textiles, steel distilleries, coal and mineral mining industries, drugs, glass, cement, petroleum industries etc. Thermal, atomic and electric power plants are also the villain to add pollutants to the soil. Fly-ash, many industrial effluents are either discharged into streams or dumped into the surroundings land. Industrial wastes mainly consist of organic compounds along with inorganic complexes and non biodegradable materials. These pollutants affect and later the chemical and biological properties of soil. 2- Urban wastes: urban wastes comprise both commercial and domestic wastes consisting of dried sludge of sludge. All the urban solid wastes are commonly referred to as refuse. Solid wastes and refuse contribute to soil pollution. This reuse contains garbage and rubbish materials like plastics, glasses, metallic can, fibers, paper, rubber, street sweepings, fuel residues, leaves, containers, and abandoned vehicles and other discharged manufactured products. 3- Radioactive pollution: Radioactive substances resulting form explsion of nulear devives, atmospheric fall out form nuclear dust and radioactive wastes penetrate the soil and accumulate there creating soil pollution. Radioactive substances Radium, Thorium, Uranium, Carbon (C-14) are very common in soil, rock, water and air. The product of nuclear fission, Rain water (Sr-90, Cs- 137) to be deposited on the soil and emit gamma radiation. Recently it has been indicated that some plants such as lichen and mushroom can accumulate Cs- 137 and other radio nuclides which concentrate in grazing animals. (a) Fertilizers: Fertilizers are the chemical compounds contain one or more of the plant nutrients i.e. Nitrogen, phosphorus and potassium. Excessive use of fertilizers make soil pullulated. Fertilizers are retained by the soil and crop efficiently but there are some possibilities for the nitates to be washed out due to negligence appliances in applying fertilizers to arable lands. These nitrates cause several undesirable effects on the water quality of low land lakes or rivers creating numerous health hazards. (b) Pesticides: By growing population density it is necessary to increase food production. Duet to this it led to manipulation of land resources. Different kinds of pesticides used to control pests are causing a stress in the natural environment. With the increasing use of pesticide it is observed that pesticide residues coexist with in biological system with other form of life. protect the soil fertility, to kill the hazardous insects. These chemical agents are reported to cause alternation in both agricultural and horticultural soil areas. They containing several toxic metals such as Pb, As, Cd, Hg, Co etc., which when applied to a land will accumulate on the soil permanently thereby introducing these chemical components into growing crops. (d) Farm wastes: increasing population of cow, cattle etc. have resulted in considerable soil pollution. Buildings in which grazing animals are housed can be cleaned using water but the manure is also washed out and deposited as wet slurry on the land. This slurry deposited on soil may seep into the ground water and pollute it. Cattle faecal matter mainly consists of phosphates which in conjunction with nitrate cause numerous undesirable effects in the soil texture. 5- Chemical and metallic pollution: A number of industries including textiles, dyes soap and synthetic detergents, drugs, cement, rubber, paper and pulb etc. and metal industries pour their hazardous effluents in soil and water creating disastrous effects on living organisms. Synthetic chemicals and fertilizers are source of trace metals which are added to the soil either deliberately or as an impurity. In many soils 50 to 100 % of soil carbon is found comlexed with clay containing organic and inorganic components which affect the soil texture, its fertility and stabilization of soil organic matter. 1. Pathogenic organism occurring naturally in contaminated soil: Bacteria algae, protozons nematodes etc. These organisms are important agents in increasing or decreasing the soil fertility, in altering the physical texture of the soil and in attacking roots of plants. 2. Pathogenic organism excoriated b man: Human excreta include pathogens such as enteric bacteria and parasite worm such as Tenia solium. These organisms are transmitted to the man by the consumption of vegetables or fruits. reservoir and appear in streams and lakes as a pollutant harmful to man. A hazard to health form nitrate was first recognized in lowa in 1945 in the form of illness known as methaemoglobinaemia or blue baby syndrome. The illness of two infants was attributed to nitrate concentration in the that was used to make their diet. The water came from shallow wells and was contaminated with coliform bacteria, indicator of faccal pollution. It has also been suggested that the risk of gastric cancer is increased by a high intake of nitrate in drinking water. Nitrate is a particular hazard to cattle and sheep because the rumen of these animals provides an environment conductive to its reduction to nitrite. Intake of nitrate form water and feed has caused nitrite poisoning of livestock in USA for many years. The use of pesticides is commonly criticized. There are some reports that pesticides affect the balance between soil organisms; for example, DDT kills species of Collembola and carbaryl reduces the number of bacteria that hydrolyse cellulose. The side – effect create concern about the life cycle of many species of plants and animals. Some pesticides are very persistent after arsenical in nature. In some Orchards, for example, 20 years after arsenical sprays, arsenic residues continue to injure sensitive plants. Environmental hazards were first recognized with DDT, an Organochlorine insectivceide. Application of DDT which reach the soil are taken up by earthworm and insects. Concentration increase in birds eating the earthworms and insects, and increase further in predatory birds such as the eagle. Similarly in water, DDT is taken up by plankton which are consumed by small fish, by bigger fish and birds. The concentration of the chemicals in tissue of the animals increase with each step and cause their deaths. For this reason the use of DDT is now prohibited in many countries. Sediments represents a depletion of land resources, in addition to a reduction in the quality of water resources. The sediment becomes a pollutant when it fills lakes, rivers, and water storage reservoir, and when it kills fish or wild life or otherwise upsets the ecological balance. The turbidity of water laden with sediments detracts from the use of water for both consumptive and recreational uses. Sediment laden water is more expensive to treat for human use. Sediment shortens the life of water distribution system. Colloidal clay sediments act as carriers for other pollutants, such as pesticides, phosphorus and other fertilizes, lead and mercury. The radioactive substances absorbed by soils can pass into the food chain where they represent a hazard to grazing animals and humans. Strontium has been a cause of great concerns because it behabes like calcium in the food chain, the radio nuclides passing into bones from milk and other foods. It is also readily taken up by plant root and translocated to leaves, fruits and seeds. Soil acidity creates chemical and biological conditions in soil which are harmful to many plants. When soils become acidic, their capacity to absorb cations is reduced so that nutrient cations, especially Ca 2+ and Mg 2+ , pass into solutions and are reached in drainage water. The most common problem in acid soils is, however, the toxicity of aluminium to plants and for some species the toxicity of manganese. Among crops plants, barley, cotton Luccerne (alfalfa) is sensitive to acidic soil. Several elements have caused fatalities of animals and humans due to the ingestion of excessive amounts. Parts of the concern was base on the death of 65 women in Japan that was reported in 1950s, for which a causative factor was the high concentration of cadmium in locally grown rice. The concentration in the rice was high because the crop was irrigated from river contaminated by drainage water and sediments from a cadmium mine. The toxicity of lead to humans has long been recognized. During transport through the air or after deposition, lead gets converted to lead sulphate. The greatest hazard to humans from this source of lead occurs through inhalation of the paricles and consumption of leafy vegetation grown in urban garden on which the particles have been deposited. The lead deposited on leafy vegetables in urban gardens is a greater hazard because only about one half is removed by washing. At high concentration in soil Zinc can be phytotoxic, recducing the growth of plants or killing them at tissue concentration that would not be toxic to animals. Similarly other metals like arsenic, chromium, copper, mercury, nickel are considered to be the greatest hazard. become plentiful and finally deplete the oxygen in the water, which is essential for other higher forms of plant and animal life. A lake depleted of oxygen may be considered ecologically dead. Acidification, accumulation of heavy metals and other inorganic contaminated lead to the degradation of soil. The acidification (due to acid rain) of soil has many environmental effects. (i) Eutophication: Enrichment of N and S components. (ii) Forest decline: this is loss of needles and leaves, die back of the crown of the tree and death in extreme cases. (iii) Decline in fish population in lakes and stream. 1. Eutrophication: Rich soil may accelerate this process and cause ultimately the death of water bodies if goes unchecked. 2. Forest decline: This may be due to acid rain and has received much attention in Germany, Czechosloekia and Poland due to death of Pine and Silver fir forest, and have associated with SO2 . Sweden, Norway, U.K. and U.S.A. have also shown concern towards this. 3. Fish population decline: The disappearance of Brown trout (Salmo trutta) from Mountain Lake of Scandinavia began in 1900‟s and about 50 years later was associated with acidification of water. elements as impurities in the fertilizes material. High level of nitrate nitrogen contents in surface water as runoff may result in Eutrophication. High concentration in drinking water causes fatal disease in infants. Many types of cancers are associated with Nitrate increase in water. The increase of nitrate in ground water has also been attributed to fertilizers and a matter of serious concern in whole of the world. The excessive uses of nitrogenous fertilizers are responsible for such type of serious hazards on soil and in the water resources. In the extensive farming states of our country like U.P. Punjab and Haryana, the ground water has recorded a higher concentration of nitrate in the samples. In these areas the average concentration of nitrogen has been recovered very high i.e. even more than 100 mg/l where the recommended level by WHO is only 45 mg/l of nitrate. Fertilizers can contribute to Eutrophication i.e. promotion of growth of plants and micro-organism in water bodies. Enrichment of phosphorus and nitrogen by this process increase the growth of algae and water aquatic weed which choke water ways, making water turbid and unpotable. When algae die, toxins are produced. The decomposing matter reduces oxygen and thus affects secondary productivity. The land management practices which decrease sediments runoff should be followed. High losses are likely when fertilizers input exceeds crop requirement. Therefore the rate of application should be determined on the basis of soil and crop requirements. There are number of ways of which the nitrate leaching looser can be reduced. It has been found that as the amount of irrigation increase, its frequency decrease, more nitrates are leached to deeper soil layers. Therefore, with lighter and more frequent irrigation schedule nitrate leaching losses can be reduced. The word „noise‟ is derived from the Latin word „nausea‟ meaning a feeling of sickness at the stomach with an urge to vomit. Noise is now considered as a potential hazard to health and communication. Noise is defined as “unwanted sound”, “sound without value” or “disagreeable sound” and noise pollution is unwanted sound “dumped” into the environment without regard to the adverse effect it may have. Sound consists of wave motion in an elastic medium. These waves travel through the medium from the source of sound to the listner. Sound waves consist of vibrations in pressure, or oscillations of the medium in which they travel/. (I) Frequency: The rate of oscillations is called the “frequency” or “pitch” or the sound and is measured in cylces per seconds (cps) or Hertz (Hz). The frequency determines the pitch of sound have high frequencies and are more disturbing. (II) Pressure: “Sound pressure” consists of small variations in the sound medium, and as it increases, the sound becomes louder. Sound pressure is measured in Newtons per squre metre (N/m2). (III) Intensity: The third characteristics of sound is “sound intensity”. This is the amount of sound energy that flows through a unit area of the medium in a unit time interval. Sound intensity is measured in Watts per square meter (W/m2). Sound intensity decreases as the square of the distance between the sound source and the listener. An illustration of this is the sound pressure measurement of traffic noise on a motor way. At distance of 7 m away, the sound pressure is 78 decibels (dB), and at 14 m it is 75 dB, but at 28 m it is 72 dB. Human beings can only hear only sound ranging from 20 Hz to 20,000 Hz. The range of frequencies of human speech is 200 to 3000 Hz, which is best heard by humans. Thus, we can hear only sound of certain frequencies and even among them, we are more sensitive to some than to others. Sound too high in frequency (above 20, 000 Hz) is called “ultra sound” that which is too low in frequency (Below 20 Hz) is called “infrasound”. The reference intensity used is the threshold of hearing which is a sound that can be first heard at a sound pressure of 2 X 10 -5 N / m2 or a sound intensity of 10 – 12 W / m2. 1. Transport noise: the main threat of noise comes from transport sector. The transport noise includes road raffic noise, rail traffic noise and aircraft noise. (i) Road traffic noise: The chief causes of road traffic noise are the number of road vehicles and their high traffic speed point. Faster moving vehicles produces high noise from their gear box, exhaust system, vibrations from their body etc. 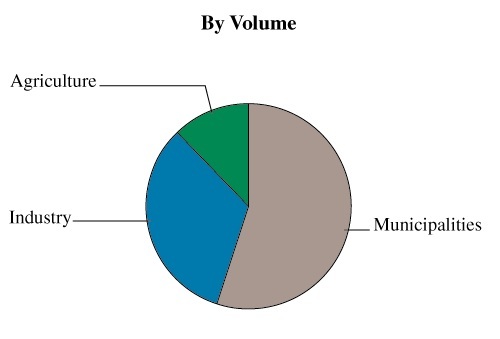 (ii) Rail traffic noise: The noise from rail traffic is comparatively lower than that from road traffic. Introduction of diesel engines or electrical engines has reduce the intensity of rail traffic noise. This was previously shown by steam engines. Besides use of welded tracks and improved coach suspension have contributed to the reduction in railways noise. (iii) Air craft noise: Larger and faster air craft produce high noise intermittently during take off, landing and during flight. Noise generates from compressor and turbine and near jet exhaust. Jet engines creates most noise around a radius of sixteen km. Soonic boom is an important aspect of air craft noise.Soonic booms occurs when an a air craft flies supersonically overhead. 2. Industrial noise: The different mechanisms of numerous industries, factories, miles produces lot of high intensity sound causing noise pollution. Some industrial process like weaning, shipbuilding, boiler making, pressing and blasting operations are more noiser than others. The operations in pneumatic drills, millings, cutters, printing press with an upward, downward and sideway moment and vibrations, cause lowering of hearing capacity to a large extent. The noise pollution is further magnified due to the installation of industries in compact place. For example, the workers in heavey industrial blowers in steal industries are exposed to sound of 112 dB for eight hours and hence suffer from occupational pollution. 3. Neighborhood noise: This type of noise includes anti-social activities of neighbors like using of loud tv, stereo, radio sets, Jazz music, fire works, parties, playing of children‟s, barking of dogs, neighborhood brawls out of intoxication and industrial neighborhood noise etc. The machines is used in house constructions like concrete mixes, vibrations, bulldoggers, heavy diesel lorry , building demolitions activities also add to the noise pollution. The central pollution contrail board (India) has prescribed permissible limit Table: Permissible sound levels as prescribed by central pollution control board. Loudness is also expressed in sones. One sone equals the loudness of 40 dB sound pressure at 1000hz. Frequency is defined as the number of vibrations per second. It is denoted as Hertz (hz). One hz equals to one vibration per second. People can hear sound from 16 (infra-audible) to 20,000 (ultrasonic) hz. Effects: Noise has been found to interfere with our activities at three levels : (I) audiological level (ii) biological level, interfering with the biological functioning of the body and (c) behavioral level , affecting the sociological behavior of the subjects. 1. Auditory effects : These include auditory fatigue, and deafness. Auditory fatigue appearing the 90 dB and may be associated with side effects as whistling and buzzing in ears. Deafness can be caused due to continuous noise exposure. Temporary deafness occurs at 4000-6000 hz. Permanent loss of hearing occurs at 100 dB. (a) Interference with speech communication : A noise of 50-60 dB commonly interferes with speech; sound of warning (signal) may be misunderstood. (b) Annoyance : Balanced person express great annoyance at even low level of noise as crowd, highway, radio etc. The effects are ill temper, bricking. (c) Loss in working efficiency : There develop tiredness and those doing mental work may put to deterioration in their efficiency or even complete loss of ability to work. (d) Physiological disorders : A number of physiological disorders develop due to imbalance in functioning of the body. These are neurosis, anxiety, insomnia, hypertension, hepatic diseases, behavioural and emotional stress, increase in sweating, giddiness, nausea fatigue etc. Noise also cause visual disturbance, and reduces depth and quality of sleep thus affecting overall mental and physical health. Other effects are, undesirable changes in respiration, circulation of blood in skin and gastrointestinal activity. Noise pollution also causes incidence of peptic ulcers. Continuous noise causes an increase in cholesterol level resulting in the constriction of blood vessels making you prone to heart attack and strokes. There may be still births and usually low weight children born to mothers living near airports. A source or sources produce the noise, and both, direct and indirect paths exist by which the generated noise could be transmitted to one or more receiver. There are following ways to control and reduce the noise menace. 1. Control at source: This can be done by (i) designing and fabricating silencing devices in air-craft engines, automobiles industrial machines and home appliance and (ii) segregating the noisy machines. The proper design of equipment to minimize the noise generation has been somewhat a complex engineering problem needing a strong background in the fundamentals of vibration, fluid mechanics, dynamics, materials and machine design. It is also important to operate all the equipment at the design conditions. Operating equipment at designed pressure and speed should result in minimum noise generation. It should be apparent that maintenance is an important element in controlling the noise generated by equipment. 2. Transmission control : This can be achieved by covering the room walls with sound absorber as acoustic tiles and construction of enclosures around industrial machinery. 3. To protect exposed person : The worker exposed to noise can be provided with wearing devices as ear plugs and ear muffs. 4. To create vegetation cover : Plants absorb and dissipate sound energy and thus act as buffer zone. Trees should be planted along high ways, streets and other places. Ashok, Neem, Tamarind etc. are good for this purpose. 5. Control through law: Silence zones must be created near schools, hospitals and indiscriminate use of loudspeakers at public places must be prevented by laws. Adequate restriction must be put on unnecessary use of horns and vehicles plying with out silencers. There are already such laws in some countries as UK and USA. In India, we have Motors vehicles Act which provides restriction on trucks using double sirens while passing through some localities. But this is not enough. In Delhi and Bombay, there are flights round the clock at airport. Delhi is closely following Bombay in noise pollution and if adequate steps are not taken to reduce sound level, more than 50% of Delhi will be affected in coming years. Restriction may be put on air craft flight at mid-night. 6. Education : No doubt we have the technology to control nearly every kind of noise. We know very well about the sources and impact of noise pollution. But the main problem is that the people are not aware that the noise is one of the main environmental problems. Public must be made aware and educated about noise nuisance through adequate news media, lectures and other programs. The movement against noise pollution is very weak in India. The main reasons being that most of us do not consider noise as a pollution but as a part of routine life. Solid waste can be broadly defined as those wastes which have been rejected for further use and which can neither be transported by water into stream nor can readily escape into the atmosphere. They include all the discarded solid materials from municipal, agricultural and industrial activities. (1) Domestic wastes: These include wastes from households preparation, cooking and serving of food, waste paper and plastics, cloth, rags etc. (2) Municipal wastes: These include garbage and rubbish from households, offices, hotels, markets etc. and also the street refuse such as street sweepings, dirt, leaves content of litter receptacles etc. The term “garbage” is generally used to putrescible or biodegradable food wastes. The term “rubbish” is used to denote non-putrescible or non-biodegradable solid wastes which include combustible materials (e.g., paper, cloth, plastic, tyres etc.) as well as non-combustible materials (e.g., broken crockery, metals, glass, masonry wastes, used metals cans and containers etc.). Apart from these, the following types of special wastes are also encountered: ashes, cinders, dead animals, abandoned vehicles, construction and demolition wastes, septic tank sludge, pipes, wires, conduits, insulations etc. b) Processed wastes which depends upon the type of the products being manufactured, such as tannery wastes, weaving and dying wastes, food-processing wastes, plastic wastes, rubber wastes, metal scarps etc. from the respective industrial establishments. Mineral wastes from mining and mineral processing units also fall under this category. (4) Agricultural wastes: These wastes result from farm, feed lots and livestock yards. The agricultural wastes include paddy husk, baggasse form sugarcane, tobacco and corn residues, slaughter house wastes, manures, etc. (5) Special wastes: These include hazardous wastes from different sources e.g. (a) Radioactive wastes from nuclear power plants, laboratories, hospitals etc. (b) Toxic substances such as heavy metal sludge, pesticides, pharmaceuticals etc. (c) Biological products such as enzymes, antibiotics, pathogenic and pathological wastes etc. (d) Miscellaneous products such as inflammable substances, corrosive materials, explosive, security wastes etc. “Biomedical” waste refers to any waste that includes anatomical waste, pathological waste, infectious waste, hazardous wastes and other waste generated in health care facilities and medical laboratories that requires special handling. Previously, the terms “pathological‟ and “institutional” wastes were used to refer to what is now considered “Biomedical waste”. The ministry of Environment and Forest, Govt. of India, Classify biomedical waste according to the categories presented in Table, The ministry recommends that biomedical waste be segregated and packaged in leak-proof, color-coded plastic bags to facilitate identification, handling, storage, decontamination and transportation. Waste collection and handling at most hospitals in Ontario involve the transport of waste by employees from the point of generation (patient‟s bed, operating room, laboratories, etc.) to initial storage points (usually enclosed containers in utility rooms) in each hospital unit. At some hospital, waste considered to be “contaminated”, such as urine containers, histology laboratory cuttings, tubes and bags containing blood, spinal fluid containers and waste from isolated patient‟s rooms, are placed in colored – coded plastic bags for seprate handling. To minimize the potential risk of public exposure to hospital waste, some hospital use rigid containers for transporting the color-coded bags along routes within the hospital that are accessible to the general public. The use of rigid containers in this situation is considered good practice and is recommended for all hospitals. Existing waste collection and handling produces vary from hospital to hospital in Ontario and the practice of colour coding the disposal bags for seprate handling is not consistent. It is, therefore, recommended that the colour – coding system be adopted so that all biomedical waste can be immediately identified. The use of the colour –code should be exclusively to biomedical wastes to preclude public exposure during general purpose disposal. Introduction waste is a valuable raw material located at wrong place and can be converted in to useful products by making use of appropriate processing technologies. a. Agricultural and forestry waste it contains non edible seeds, Saw dust, wooden waste, rice husk, bran e.t.c are biodegradable but the degradation time is higher than normal organic mater. b. Animal waste it contains waste from slaughter house, leather and woolen waste e.t.c. c.Industrial and mineral waste this includes slag, cool ash, fly ash, mica waste, extraction of lead and strontium from used batteries and some waste of chemical industry. d.Community waste this waste includes garbage, kitchen waste, night soil and liquid waste including sewage and sullage comprising all waste water and night soil. While leaching of P and K is less common but these elements can be mobilized by erosion and transported by dried manure particles. Disposal methods The various methods of solid waste disposal are. Land filling it is one of the methods of handling urban garbage and used as disposal site of ash produced after incineration process whole dumping occurs in well prepared sanitary land fills. Municipal solid waste contains sufficient amounts of degradable organic material i.e food waste, wood, paper e.t.c. Microbial degradation of organic waste occurs in presence of O2 which act as electron acceptor and produce CO2 and H2O as major end products while compact nature of waste create anaerobic condition and produce small molecular weight organic acids along with carbonate species and H2 gas. refuse is filled up or dumped in to the layers of 1.5m and each layer is covered by good soil of at least 20 cm in thickness so that refuse is not directly exposed with passage of time waste get stabilized by decomposition and converts in to stable compounds. In this process leached materials is collected from the landfill and treat it for removal of harmful elements. Advantage. It is simple and economical, no costly plant and equipment is required and segregation is not required. Ø It requires large land area, continuous production of foul smell near the dumping site affect the aesthetic beauty of place. Ø The biggest disadvantage is formation of leachate, which is a coloured liquid having Ph less than 4.5 and capable of solublising some metal this characteristic make high amount of Ca++ and Mg++ ions and have high COD value. At low pH methane producing bacteria do not function efficiently and methanogenic bacteria become dominant and degradation is due to fermentation leads the formation of CO2 and CH4. atmosphere. Incinerators generates toxic chemical like dioxins and furans formed directly from chlorine and chlorinated products like paper, gloves, catheters and other plastic substance. Their working mechanism is almost common but design of the incinerator has been found to influence the rate of harmful substance and particulate loading in flue gas and residual bottom ash and fly ash after combustion process. These ashes contains heavy metals like As, Cd, Hg, Pb,Gases like HCl, SO2, Poly chlorinated bi phenyl, Furans and Dioxin. The minimum temperature in the combustion chamber should be greater than 6700c and normally ranged in between 800-10000c for reduction of dioxin. So it is possible to obtain 4*109 KJ of energy from 1 tonne of waste from hazardous waste incinerator. If the furnace is operating under pyrolysis or reducing condition S will be converted to sulphide and will react with lead to generate PbS which is volatile around 1000oC. While medical waste incinerator is contains two chambers first chamber have temperature around 800oC and in second chamber temperature is about 1050oC.Installed thermoclave disinfects the segregated substance in high pressured steam so that these substance can be reused. Recently Gujarat based facilitation centre for industrial plasma technology (FCIPIT) has developed the plasma pyrolysis system for the disposal of medical waste. It consist plasma torch unit, scrubbing unit and two chambers unit for combustion. The system runs with the help of plasma (a collection of electrically charged particles such as electron and non charged particles like radicals).The temperature of plasma can increased up to 10000 0C in it electrical energy is converted in to heat by two electrodes at such temperature all solids is converted in to gases (CO, N2, H2) slag and ashes leaves behind. Gases are treated with chemical or water in scrubbing chamber the whole process is carried out in the absence of O2. Advantage. Such incineration volume up to 90% d weight up to 70% of waste. No smell, No destruction of aesthetic beauty. metals condensed with aerosols and readily affect physiological reaction of living organism. Ø One more major problem is Hg a large part is pushed in to environment and pose health threats to consumer who takes food, grown near incinerator and there by complete food chain get affected. Pulverization M.S.W is pulverized in grinding machines so as to reduce its volume and change its physical character. It make odorless surrounding and unattractive to insects. Although it contains fertilizing elements but it can not be suitably used as manure due to high toxic metals. Composting Putrescible organic matter in waste is digested in to humus and stable compounds. It is a hygienic method which converts the solid waste in to manure through anaerobic bacterial action. It solves three major problem i.e Disposal of waste, disposal of night soil, production of valuable manure for crop. Open window coposting In it coarse and inert matter is first removed from the solid waste and then dumped on open ground by making 5-10 m long, 1-2 m wide and 0.5-1 m high piles then these piles are covered with night soil or animal dung. For successful decomposition at about 60% moisture content is required. After few days piles are turned up for proper aeration and complete degradation takes 4-6 weeks. Mechanical Composting It stabilizes the waste with 3-6 and various units are involved in it for segregation, shredding or pulverization and stabilization. Dumping In to Sea Solid waste disposal near coastal areas is carried out by dumping waste in deep sea water. This depth should be more then 30 m and at a distance of 16-20 Km. The major disadvantage is this during high tides some portion of waste may return and spoil the Beaches and shore line.